I consider the stretch from Stovepipe Wells To Towne Pass as the most difficult section of the course due to the following: 1) the runner had already ran a distance of 40 miles without sleep and exhaustion is about to creep in; 2) it’s the 2nd morning and the temperature is almost the same when one started and it can rise up to 127 degrees Fahrenheit in the middle of the day; 3) if the runner has the tendency to have an imbalance of electrolytes in his body system, the body will not be able to process whatever food intake, whether they are in the form of gels, liquid, or solid food; and 4) and the relentless uphill climb which is about 5% to 10% gradient where you can see the point where you should reach at a distance is too much to bear and think that particular uphill climb is endless. Tess and I were well-supported by our Support Vehicle and Crew on this portion/segment as they would stop to refill our hydration bottles every 500 meters to 1 kilometer. Tess would be only treated with Ice Cold Water spray by our team once she reaches the Support Vehicle. Sometimes, I would use the water from my Simple Hydration to douse ice cold water to Tess’ head. However, I did not have the plan or thought of carrying the ice cold sprayer bottle while I was pacing her. There are pacers who would follow their runners behind with a bottle sprayer and it was my first time to see such. By doing this, there is a tendency for the ice cold water to become a hot water while it is being carried by the Pacer due to the heat of the environment. The ice I place in my Simple Hydration bottle whenever I reach the Support Vehicle would be easily transformed to a hot water in a few minutes while I was following Tess. As compared with the Salomon Collapsible Bottles which I had for my electrolyte drinks, I’ve observed that the coldness of the liquid stays longer than the ice water in my Simple Hydration Bottle. During my pacing job to Tess, I was carrying with one Simple Hydration Bottle with Ice, and later melted to Ice water; and a 20-ounce Salomon Collapsible Bottle with my NUUN Electrolyte drink. So, for our relentless climb to Towne Pass, we repeatedly refilled our bottles whenever we reached our Support Crew/Vehicle. We also had the time to ingest some food available in our Support Vehicle. We had KIND Fruit & Nut Bars (my primary food intake); fresh fruits (apple bites and ice cold watermelon); Rice O Roni; Champorado; Cookies; Sandwiches (prepared by Jas); Noodles; Pizza; Peanut Butter; Ham; Gels; Bundaberg Ginger Beer; and Ice Cold Soda (Coke & Mountain Dew). These food were prepared and served to us during the run, most specially along this segment of the course. I bought two packs (8 pieces) of KIND Fruit & Nut Bars and two packs (8 bottles) of Bundaberg Ginger Beer which I intend to use as my source of food and cure/treatment for any GI issues I might have during the run. I offered/gave one KIND Bar to Tess on our uphill climb to Towne Pass but she only took a bite and returned the remaining bar to me. I was then forcing her to eat some solid food but she would prefer her instant Champorado. I ate the remaining bar and consistently fueled by this fruit & nut bar which is a mix of sweet and salty tastes. I also started to introduce her to drink the Ice Cold Bundaberg Ginger Beer to make her stomach settle due to her frequent throwing out of her food and drinks from her stomach. I wanted her to finish one bottle during the course of our run for a few kilometers but she would not want it. Frankly speaking, this Ginger Beer and my NUUN Electrolyte Drinks had arrested my problem on my GI issues of not being able to fully process my ingested food in my stomach. Our pace/speed was on the average at this segment even if we slowed when we were about 2 miles from the peak of Towne Pass. I told Tess that we will be able to even up or make up for our lost time as we descend from the peak of Towne Pass. It was a matter time as we relentlessly power-hiked the remaining portion before we crest the top most portion of the Pass. After we refilled and re-fueled on top of the Pass, we tried to increase our pace/speed and we were making good with it. However, the strong crosswind coming from our right side or right portion of the mountain pass was so strong that it slowed us down. Coupled with the heat of the day, we would hike and run but our hike would become longer than the time we would run or jog. At this point, I could see that Tess could not cope up with the increase pace that I would like her to attain. So, we walked and I allowed her to dictate the pace of our run/jo/hike down from Towne Pass. There was a time that she asked for a Peanut Butter Sandwich and that she had to throw it away after a bite on the side of the road. As for me, I would eat everything that I was offered by our Support Crew. Even if I was running and jogging, I was still fresh because I had only about 20 miles of running from Stovepipe Wells. Plus the fact that I was well hydrated and fueled by the solid foods I was eating/ingesting. There are two important things that I did to entertain Tess while I was pacing her: First, talk to her and ask her about her past sports and past “love life”, however, I was not sure if it made her more motivated during the run or it made her weaker for asking her. Second, my regular Farting behind her made her laugh and smile at first but when it was becoming repeatedly heard, I was not sure if the smell had jolted her body system once in a while or had to stop breathing just to let the smell pass away from us. The descending portion from Towne Pass would cover almost 9 miles and we would stop from time to time to refuel and refill our bottles. As we reached the bottom portion of the Pass, it was again another seemingly flat but increasingly uphill climb to Panamint Springs which could be seen from a distance. It was another challenge to us to be boringly looking up to the place of our destination along a straight wide road as if it is an endless road to run. The 7-mile road portion up to Panamint Springs seems to be easy but the strong headwind coming from the desert was battering us head on to our uphill climb pace. We would run/jog and hike to reach our Support Vehicle repeatedly. There was a time that our Support Vehicle would park away from us longer than one kilometer that it took us more effort to reach it because of the hot headwind that would meet us along the way. Our Team would look for a more stable shoulder where they would park in order to avoid from being being stucked in the place and need someone to help them push the vehicle. I would complain that they had parked so far that we had consumed already our water before we reached them. At this point, I was feeling dehydrated but I would drink a lot of water and electrolyte drinks just to arrest and remedy such situation. 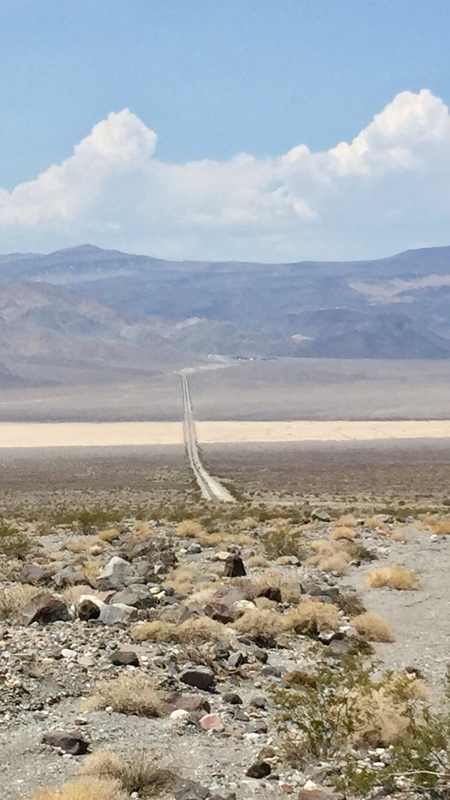 This uphill climb to Panamint Springs is very memorable as runners would hear the roar of jet planes or fighter jets of the US Air Force in a nearby Air Base passing and crossing above the route. There was a time that you can feel and hear the roar of a passing fighter jet plane on top of you but when you try to look up in the sky, you could no longer see any figure or form of a jet in the horizon. I would learn later after the race that this place is the training ground of the famous Stealth Jet Bombers which you could hardly see because of its speed and its appearance to blend with the sky. 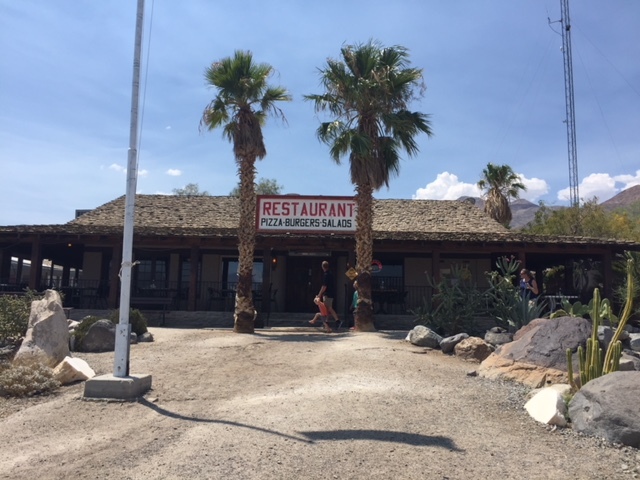 It took us a lot of time to reach the Panamint Springs and the last two miles was too painful for Tess as she lagged behind down the road. I went ahead of her to the Time Station just to make sure that the Race Marshals were there to check us. Finally, Tess arrived at the Time Station at Panamint Springs weak and exhausted. She told me that she will have a shower at the “Cottage” and try to sleep for some time but she was already telling me to DNF at this point. I suggested her not to think of pulling the plug off at this place as she has at least 35-40 minutes buffer time before the cut-off time and we have a lot of time to reach Darwin after her rest at Panamint Springs. 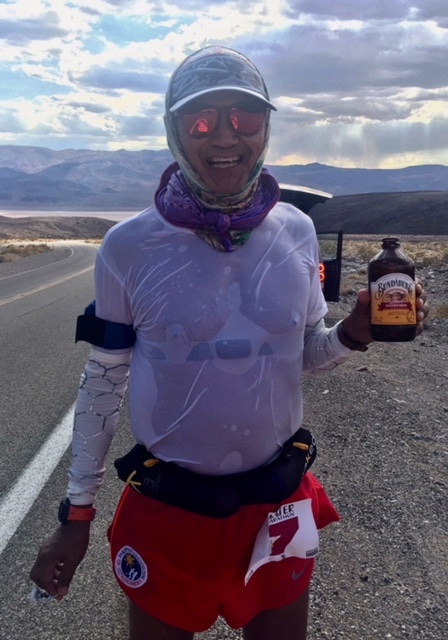 She has 9 hours to cover 17 miles to Darwin and after reaching Father Cowley’s Pass Vista Point which is 5 miles from Panamint Springs, it is all downhill and flat roads to Darwin for the remaining 12 miles before the next cut-off time of 5:00 AM of Tuesday morning. While Tess was having her shower and sleep/rest in the “Cottage”, we had the time to refuel/gas up our Supply Vehicle; resupply our stock of Ice but instead bought frozen bottled water by the gallon (8 gallons of frozen water) due to the fact that the 6,000 packs of Ice prepared for the event were all sold out as early as 6:00 PM of Tuesday; and we were able to have our first decent dinner/meal during the event Panamint Springs Restaurant; and we also had time to have our first Shower/Bath at the Park across the road from the Restaurant. The shower was Free with Towels. We ordered food for Tess but she did not mind touching it after she woke up from her sleep. The food that we ate at the Restaurant was the most expensive one that we had in California and to think of it that the food we ate were pasta and hamburger meals! Tess was already reluctantly and forced herself to DNF at this point when she finished her shower and nap. I talked to the Race Marshal at the Time Station and told me that there are still at least 3 runners behind us and about 25 runners had DNFd already before reaching Panamint Springs! Wow! I was surprised later to know that at least 3 former Champions and Course Record Holders had DNFd at Stovepipe Wells and some at Furnace Creek. We were able to encourage Tess to push up to the peak of Father Cowley’s Pass with Khris as the Pacer with the arrangement that I would pace Tess again once they reached the peak. Tess and Khris left Panamint Springs at 9:30 PM with 3 other runners left behind at the Cottage. After 3 kilometers, I parked our Support Vehicle in a designated Parking Space at this ascending zigzag part of the route. It took Tess and Khris 1.5 hours to hike the distance. Again, Tess pleaded to DNF but we would find a way to ease her GI issues by giving her White Flower Ointment. The ointment made her continue but after two kilometers, I was told by Khris that Tess would be holding his arms as they walked along the road. I drove the Support Vehicle to the Parking Area of the Father Cowley’s Pass Vista Point (Peak). As I was driving, I would see Tess lying on the road while Khris was giving her massage on her legs. At this point, I have concluded that Tess is done with the race. The distance of 8 kilometers from Panamint Springs to the Father Cowley Pass Vista Point had been very painful and brutal to Tess’ condition and it took her almost 4 hours to reach the peak. There was no way she would recover and then cover another distance of 12 miles (20 kilometers) for 4 hours (5:00 AM Tuesday is the next cut-off time in Darwin) with her condition. While we were parked at the Vista Point, the Park Ranger/Race Marshal would come to us and inform us that our runner were seen by them to be lying on the road. At the Support Vehicle, we waited for the arrival of Tess and Khris and our Race was over. We are bound for Lone Pine, California, 35 miles away, and it will be my 2nd night without sleep as a Driver and Pacer of the Support Vehicle and Tess, respectively. I wonder if I could still drive with one eye open and the other eye closed and reached Lone Pine safely.